Thanks to the social-networking site Facebook, I've been traveling back in time to my teenage years. 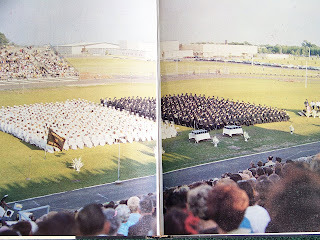 This year marks the 40th anniversary of my high-school graduation, a fact undetected by my mental radar until a cadre of long-forgotten classmates "friended" me on Facebook. As I began receiving e-mail from people I hadn't heard from in decades, my mind drifted back to my Pennsylvanian roots. High school was an emotional time. As with so many of my peers, my days were a swirl of feelings in constant collision with a maze of social, political and philosophical discoveries. Love, frustration, elation, disappointment — during my teenage years, I felt them all in varying shades and degrees of intensity. I struggled with fitting in or — more accurately — with not fitting in with any of the many cliques that so acutely define the high-school experience. I wasn't a geek, a complete freak or a brain. Although I was on the field hockey team for a while, I was hardly a jock. Nor was I a member of the band, chorus or any other defining section of the high-school community. I was involved with plays — always behind the scenes and in minor parts — and contributed regularly to the literary magazine. A thinker and dreamer, I found myself on the outskirts of several groups, never meshing for long with any one faction. Although I had spent my first 18 years in the same town, none of my personal connections managed to last for long once high school ended and I moved away. Maybe that's why it feels strange to be suddenly awash in a sea of semi-familiar names and faces. As I struggle to remember the people now contacting me, I find my memory surprisingly foggy. Why is that? How can such incredibly important years be so difficult to recall? For assistance, I've brushed the dust off my yearbook and scanned the pages in search of triggers. Unfortunately, that immortal tome of hormonal expression hasn't been much help. The 40-year-old images of girls with pageboy haircuts and boys with tucked in button-down shirts only remind me of how uninvolved I was with school activities. There were about 1,000 graduates in my class. Like most of my classmates, I was aware of the ever-popular football players, cheerleading squad and student council, but my yearbook documents the existence of so much more. Apparently, my high school had a swim team and although I went there for four years, I can't recall ever seeing a pool. How is that possible? The depth of my obliviousness is astounding. Thanks to Facebook I am reminded of how much I've forgotten. Far beyond names and faces, events that once seemed immensely important now barely elicit a memory blip. I guess time has a way of sorting through the mass of information that floods our minds and filing it all away in a manageable fashion. High school may have seemed all-encompassing at the time, but in reality it barely took up 4 percent of my 57 years. So much has happened since 12th grade ended and the rest of my life began. Traveling back in time can be fun. It can be interesting learning about people in our past, especially when we chance upon that rare someone with whom a true connection can be made. But maybe the best part of this whole return-to-high-school-revisit-my-roots experience is how much it makes me appreciate the present.